Early this morning at the Marikina Sports Center, volunteers were giving away from wallet-sized calendars of MMDA Chairman Bayani Fernando. 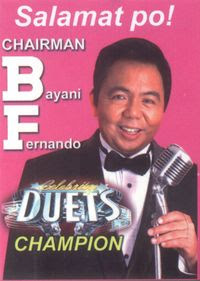 The picture shows Bayani in a Tux depicting his win on GMA-7's Celebrity Duets Season 2. There's no guarantee you can get this around the Sports Center vicinity. But I guess volunteers will scatter around Marikina to give out calendars.